With school budgets stretched thin all over the USA, welcome news comes from the Solar Foundation and the Department of Energy’s SunShot Initiative. You’ll be surprised how much money solar helps schools save. The study on solar in U.S. schools, called Brighter Future, has found that nearly 2.7 million K-12 students now attend schools that use solar power. And at a compound annual growth rate of 110%, these numbers are growing rapidly. The electricity generated in one year by all school PV systems equals $77.8 million per year in utility bills, an average of almost $21,000 per year per school. What do these numbers translate to? Try 155,000 tablet computers, or nearly 2,200 new teachers’ salaries per year. The report presents up-to-the-minute (March 2013 through July 2014) and comprehensive basic technical and financing advice on how solar helps schools. Information presented comes from the Solar Foundation’s inclusive National Solar Schools Census. If you live in one of these states, you have a head start for introducing solar power in your education systems. If you don’t, you’ll be happy to know that your school has plenty of reasons to convert. Using solar instead of fossil energy deeply reduces greenhouse gas and other pollutant emissions. Solar also nicely hedges against projected increases in utility rates. Solar helps schools protect the health of students, personnel, and residents of areas nearby. Because solar electricity production uses far less water than traditional energy sources, it’s especially useful in drought-challenged prairie and western states. 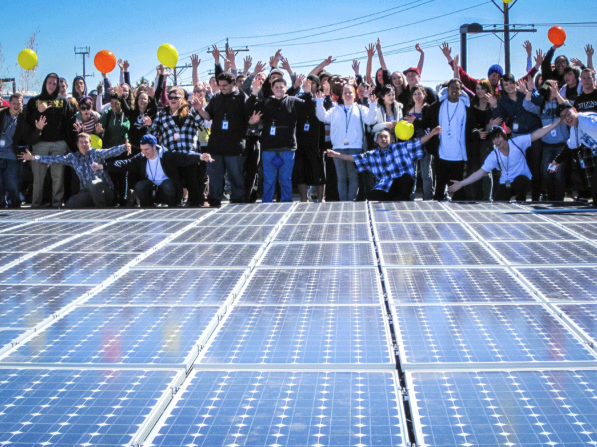 An added benefit: solar installations at schools provide teachers with a hands-on opportunity to teach concepts in science, technology, engineering, and mathematics (STEM), raise student interest, and improve math and science skills in these subjects, which are often found to be below par in US school systems. In Appendix A, the report details many free, high-quality educational resources to choose from. Taxpayers and other stakeholders in school budgeting can use the actionable information and project experience presented in the new report to go solar with proven results. Of the 125,000 schools in the country, 40,000 to well over half (72,000) can implement solar cost-effectively. If the schools where costs balance out deploy systems proportional to student body size, the electricity generated would equal the effect of taking approximately a million passenger vehicles off the road. Many educational institutions greatly underestimate the cost savings and other benefits of solar installations. Both photovoltaic and solar thermal thrive on the large, flat rooftops of school buildings. Solar PV canopies can do double duty by shading parked vehicles on sunny days as well as producing energy. Vacant land on campuses, especially in non-city locations, makes an ideal location for medium-sized solar PV energy farms. And solar helps schools with space and water heating in swimming pools and ancillary facilities, delivering significant cost savings to school districts. The solar experts provide a table of schools with solar energy systems by state that lets you see at a glance how your area stacks up to other states according to five variables. Also, an interactive map shows all the nation’s schools with positive net present value benefits that appeal to a broad set of stakeholders. Great information comes from the report’s studies of varying situations in different areas across the country and the challenges and lessons learned there. You can help your district with these facts and figures about questions about cost-effectiveness, financing, the solar procurement process, and development risk. The report also improves the quality of community-board engagement and dispels some of the persistent myths and misconceptions regarding solar energy. An added benefit: a clear explanation and some useful help when those involved in planning and development need to understand and comply with state and local regulations. Options available include incorporating solar energy into local planning processes and zoning codes, streamlining and expediting the solar permitting process, developing statewide interconnection standards, working with local lending institutions to develop financial products for solar, and supporting or leading solar market development programs. You’ll find more information on these topics here or by contacting The Solar Foundation. The final way solar helps schools—and probably the best known—is that using clean energy technologies like this can help significantly reduce emissions of pollutants that can harm human health and the environment. Implementing solar conserves natural resources and significantly reduces emissions of harmful and climate-altering pollutants. Like homes and businesses, schools save big with solar!